The core is an often-obsessed about part of the body, and yogis are no exception. In this episode, Jason breaks down the component parts that make up the core. He also offers three ideas for tapping into those parts we ignore — from paying attention to rotation, to the paraspinal muscles to learning to, at least once in a while, let your core go and let it all hang out. 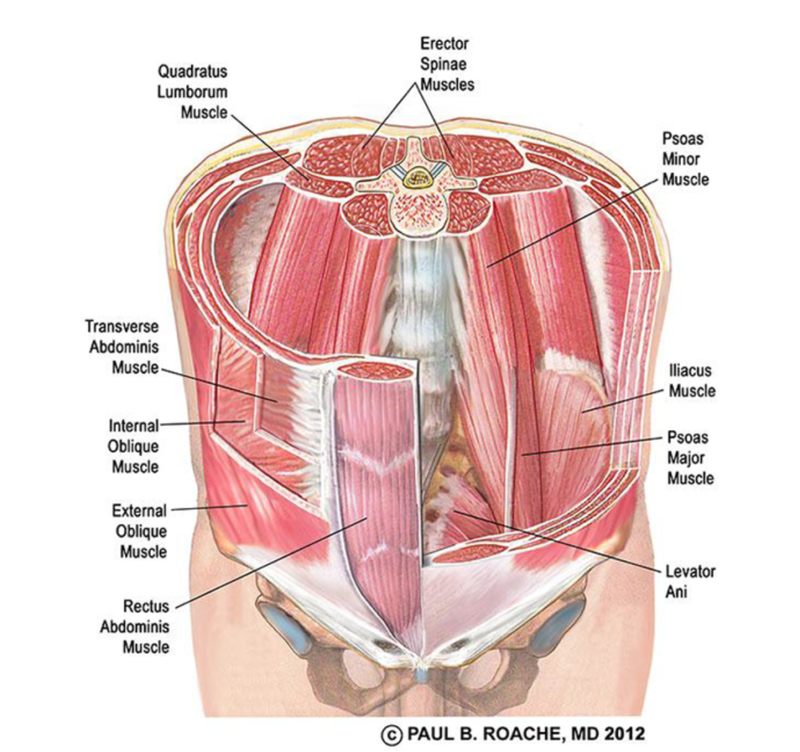 As promised, an anatomical view of the core (and many of the muscles we mention in the episode). To learn more, check out the related links below. 1. 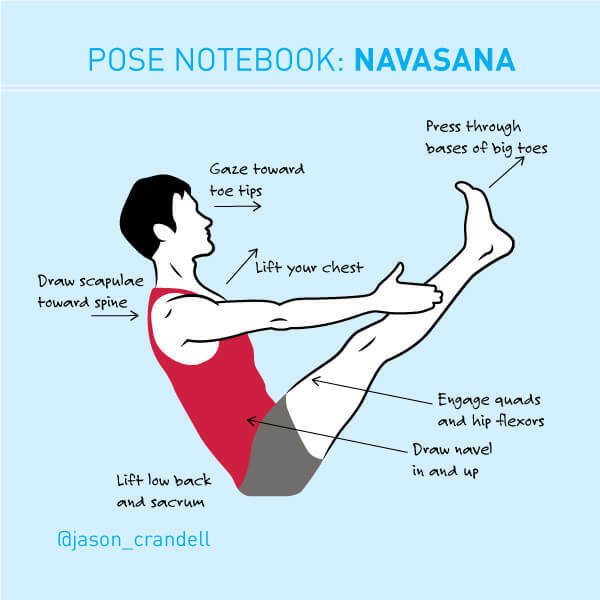 You can simply practice Navasana using the illustration above. I don’t like to admit it, but I’m a pretty nostalgic guy. So, when I look back at the years I spent practicing Ashtanga Yoga, I’ve got nothing but good things to say. Wellll…except for that point where you repeat Paripurna Navasana to Tolasana, over and over again. If you practiced Ashtanga Yoga, this series also got you every time. Right? Admit it, you’ll feel better. I may have loathed the Navasana series, but I’ve always respected the pose. The posture simultaneously strengthens your hip-flexors, abdominals, and adductors—not to mention your resolve. If you’re looking for one posture that works your entire core, strengthens your body for arm balances and inversions, and builds heat in a very short period of time, you’ve found your match. I instructed my students to sit on the front edge of their sitting bones in this pose for a decade. 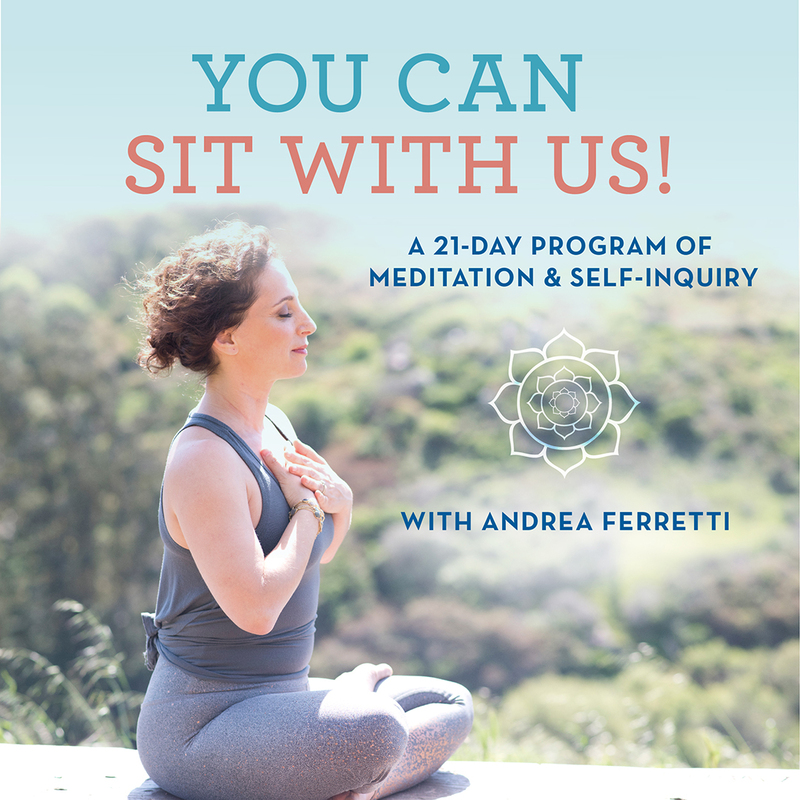 I’ve long since changed my tune because no one—I mean no one—is actually on the front of their sitting bones in this posture. You don’t want to rock too far back, but if you look at the image below you’ll see that the sitting bones are shaped like a rocking horse. 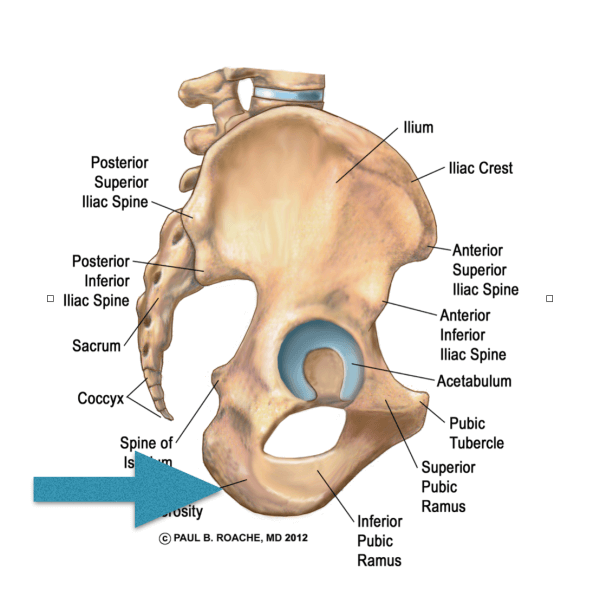 In order for you to truly be on the front of your sitting bones, you’d actually be in the inferior pubic rami, your pelvis would be rotated forward and your spine would be vertical. That’s not happening in Navasana for anyone. More accurately, you’re sitting just behind the center of your sitting bones and the front of your tailbone. Check out the little arrow on the diagram below. That’s where you’re sitting. If you want to learn more, join me live at my 500-hour Yoga Teacher Training Certification Program or join me online for my Sequencing and Anatomy Online Courses. Paripurna Navasana strongly contracts your abdominals and hip-flexors. Secondarily, it engages your inner legs and lower back. To warm up your center before doing Navasana, practice “core connector” (see Abs Reboot if you’re not already familiar with this pose). You can also do a few Sun Salutations to get your blood moving. 1. Start by sitting on your mat with your knees bent and your feet on the floor. Lift your heels off the floor and press your toes into the floor. Imagine you’re trying to pull your mat toward you with your tiptoes. Feel your hip flexors begin to kick into gear. 2. 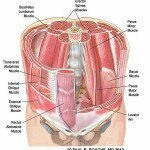 As you hip flexors fire up, draw your lower belly toward your spine. Lengthen up through your spine and lift your chest. 3. Keeping your chest lifted and broad, raise your shins until they’re parallel to the floor. 4. Squeeze your inner legs together to engage your adductors. Reach your arms forward so that they’re parallel to the floor. If you want to challenge yourself, you can reach your arms toward the ceiling. 5. Continue working with your knees bent and your shins parallel to the floor. Or, intensify the posture by straightening your legs. If possible, elevate your legs so that your toes are the same height as your eyes. 6. Refine the posture with the cues in the infographic. 7. After 3-5 breaths in the pose, slowly lower your legs and rest. Repeat 3 to 5 times. IF I CAN’T DO PARIPURNA NAVASANA YET, WHAT SHOULD I DO INSTEAD? If you can’t do Navasana, you need to work on other core-strengthening postures that are more accessible. Please check out the reclined core postures in this article. And, remember that you can always keep your knees bent and your fingertips on the floor in Navasana if you need more support. WHICH MUSCLES DOES NAVASANA STRENGTHEN? If you want to see some visuals and understand your core more completely, check out my Illustrated Guide to Yoga and Your Core, Part 1 & Part 2. Your hip flexors (specifically your illiopsoas and rectus femoris) bear the brunt of this posture. The higher you lift your legs and the more vertical you make your torso, the more your hip flexors work. Although your abdominals play second fiddle to your hip flexors in Navasana, they are still chugging along. While all of your abdominals are firing away in this pose, your transversus abdominis has the biggest job. It’s responsible for the “navel toward spine” action and it’s working hard to your torso stable and upright. Your adductor muscles are working to keep your inner legs squeezed together. To strengthen this group even more, experiment with squeezing a block between your inner legs in this pose. Your spinal muscles, especially the erector spinae group, are engaging to help your torso stay upright. 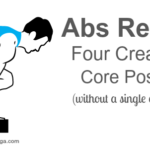 They’re working with your abdominals to maintain the natural curves of your spine. You can sprinkle Navasana nearly anywhere throughout your practice and classes. Practicing Navasana early in the sequence helps students warm up and connect to their center. Practicing Navasana toward the end of the sequence can help ensure that you and your students feel physically satiated—especially if you want to create a more demanding experience. If you feature Navasana in your practice and do several of them, be sure to include a few hip flexor and quad openers afterward. 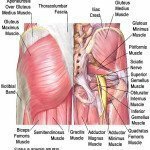 This will help re-lengthen these muscles after working to fatigue. WHERE CAN I LEARN MORE ABOUT ANATOMY, SEQUENCING, AND YOGA TEACHER TRAINING? When you regularly practice poses that strengthen your core, you’ll feel more stable in your practice and more at ease in your everyday life. 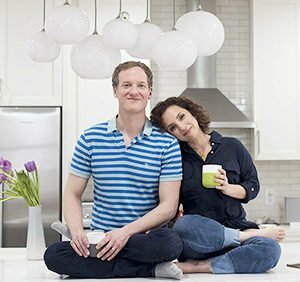 When I skip my core strengtheners, I notice that it’s hard for me to sit up straight and my back gets tired much more quickly as I’m pecking away at my computer. 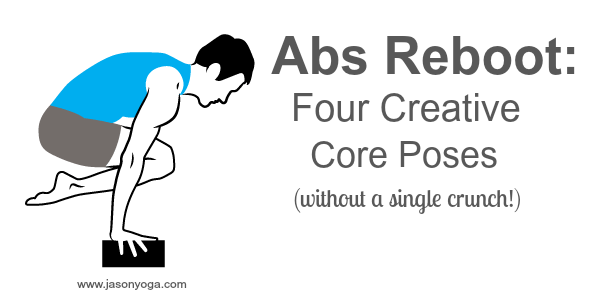 I look forward to doing core poses more if I have some creative options in my back pocket – and that’s what this post will give you. In terms of where to put these in a sequence: Core yoga poses are flexible. You can use the poses below as a way to warm-up at the beginning of a practice. You can place them just after your Sun Salutations, standing poses, and backbends. Or you can sprinkle them throughout the sequence to stay connected to your center during the entire class. The Core Connector pose is a great multi-tasker: When you squeeze the block, you engage your inner legs. Engaging your inner-legs (your adductors), will help you fire your pelvic floor muscles and your abdominals—especially our transversus abdominis. Typically the inner thigh muscles are weak and underutilized. This pose tones them and teaches you to move your thighbones out of external rotation and into a more neutral position. In modern yoga, we use the word “core” incessantly. But, what does the term “core” really mean and what do our students actually hear when we use the word? These questions don’t exactly keep me awake at night, but they do gnaw at me. Granted, I’m obsessed with clear, accurate, and accessible language, but I’m sure I’m not the only one. All yoga teachers want their students to understand what they’re saying and all yoga students want to learn how to use their bodies skillfully and effectively. Also, the word “core” evokes mixed feelings for people. After many years of teaching I’ve seen that most people think their core is flawed in some way—they either think it’s too big or too weak or both. They carry a lot of emotion and insecurity attached to it. Since the core is so often entangled with our self image, I think it’s even more important that try to understand how it works. My hope is that by understanding its complexity we can start to appreciate all that it does for us instead of simply focusing on perceived flaws. 1. 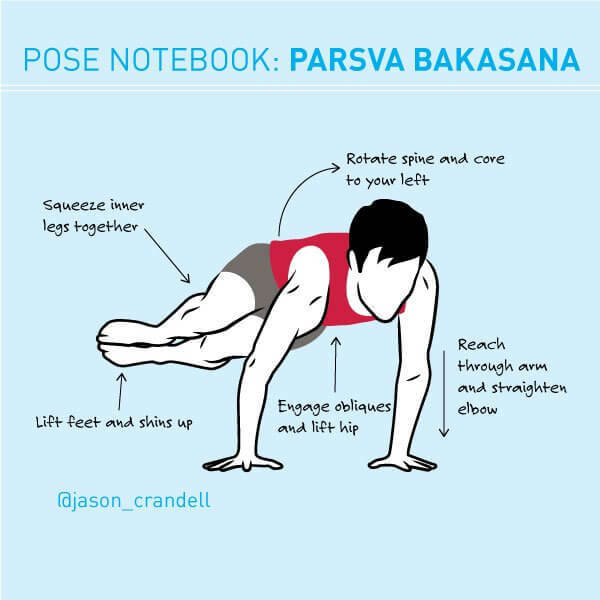 You can simply practice Side Crow Pose (Parsva Bakasana) using the illustration above. 2. You can learn the steps get into Side Crow Pose in the “How To” section. Parsva Bakasana (Side Crow Pose) is a part of the iconic Bakasana family of arm balances. I frequently include the posture in my classes and I break it down for my students this way: I demonstrate how the posture is one part twist, one part squat, and one part Chaturanga. Is it simple? Yes. Is it easy? No. Especially the version illustrated in the infographic above, where the outer hip hovers above elbow instead of resting on it. Still, it’s a good bang-for-your-buck kinda of pose since you’re strengthening your upper body and core, as well as generating greater spinal flexibility at the same time.